maam may I know your email?? I'm rini from indonesia, I'm still studying in Seebelas Maret University indonesia majoring Amarican studies. 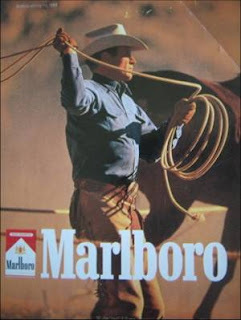 I'd like to talk more with you especially about Marlboro man and popular culture..
Pam, an American Studies grad student at Purdue from Indonesia. I found that this blog is really helpful. Thanks! I am a scholar of American studies (PhD Washington State University, 1994) who teaches Pacific Northwest history and American Indian history to adult students at a small private university. I also blog some of my reading of history at Patriot's and People's, a name that reflects a focus upon contrasting the left- and right-wing ideologically driven histories of Howard Zinn, A People's History, and Larry Schweikart and Michael Allen, A Patriot's History of the United States. I stumbled across your blog while looking for an essay by Patty Limerick concerning the Modoc War that I cannot find within my personal library at present. Your course looks interesting. I may return another day to explore your teaching ideas, as there's likely some things here that could be useful in my own teaching. I am glad that so many of you have found this helpful. I hope you will use the class syllabus to explore more readings on the west.